On a high heat, your pan, add your oil once pan is hot, fry your steaks which are rubbed with the paprika, until brown on each side for like 2 - 3 minutes. 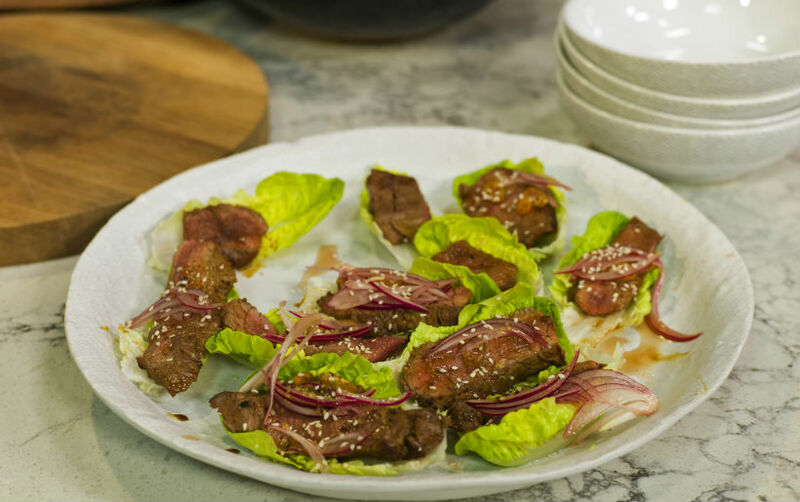 Mix together the soy and Mirin in a bowl then add to the steaks in the pan and let it reduce to a sticky glossy sauce. Remove from heat and rest for 3 minutes. Once rested, slice the steaks and put on leaves as desired. Top it off with the pickled onion and sesame seeds. Drizzle the dressing with a fork.